Join us for the latest exhibition at IHRC Gallery! Featuring artist Mohammad Hamza, the latest Intifada Street Exhibition illuminates the message and journey of Imam Hussain (AS) to Karbala in 680. Exploring many themes such as the Imam’s stance against oppression, injustice and tyranny and how the Imam’s ultimate sacrifice in the 7th century continues to inspire millions today. In September 2017 IHRC will be launching its new exhibition featuring the work of renowned artist and activist Mohammad Hamza – the founder of Intifada Street. 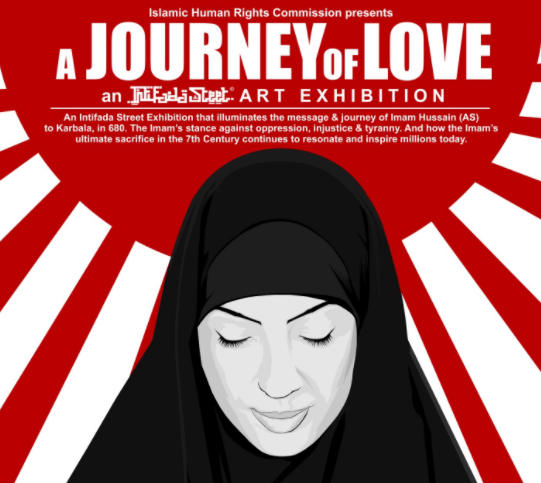 The ‘A Journey of Love’ exhibition illuminates the message and expedition of Imam Hussain (AS) to Karbala in 680. The artwork explores many themes such as the Imam’s stance against oppression, injustice and tyranny as well as his ultimate sacrifice. ‘A Journey of Love’ crystallises the human and aspirational traits of Imam Hussain – love, beauty, truth and freedom. Hamza’s understanding of Imam Hussain was as a result of his journey back to his faith. His interaction with the figure was at a time when he questioned his theological background and the historical imprint he was born into. His own context informs the art produced and his depiction of Imam Hussain. Imam Hussain was a figure who stood against oppression and tyranny and Hamza pays tribute to the sacrifices he made throughout his life. At the centre of the exhibition is the theme of love and what it means to be consumed by it. Hamza describes his art as “a labour of love” as it is not always easy to tackle issues that are unpopular and complex. He aims for the exhibition to shed a light on the ultimate sacrifice of the Ahlulbayt (as) in Karbala; the testament of their brotherhood and the patience they maintained in even in the harshest of times. The Islamic Human Rights Commission was set up in 1997 and works with different organizations from Muslim and non-Muslim backgrounds, to campaign for justice for all peoples regardless of their racial, confessional or political background. The IHRC Bookshop & Gallery was launched in 2010. The bookshop holds a range of interdisciplinary publications including new, used and rare books. The gallery space has showcased various artists and their work has been available for purchase in the shop. The gallery provides a space for exhibitions on themes relevant to IHRC’s field of work.